This Friday we bring you one of our favorite things: a photographic documentation of a building rehabilitation. The houses at the intersection of Cork and Loudoun Streets, just off the walking mall, had been in decline for some time, adding to the visual perception of the downtown as a dirty and unsafe place to be. 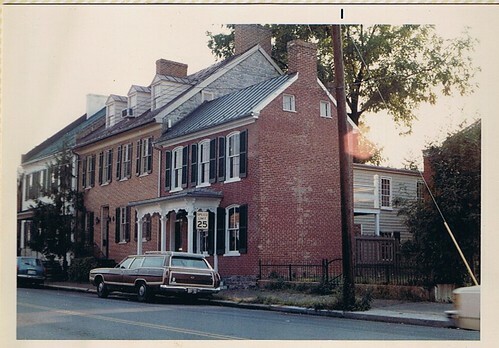 PHW purchased the house at 215 South Loudoun Street in 1979. The building was in dilapidated condition, inside and out, and would require extensive work to make it inhabitable once more. George and Vivian Smith stepped up to the challenge. Over the next two years, the Smiths worked on the home. The building was originally tentatively dated pre-1885; as work on the interior commenced, the existing moldings and mantels suggested a circa 1840-1850 timeframe. Later, the building received a facelift, adding Italianate features like the arched windows, doors, and front porch. A frame wing to the rear of the main brick house was apparently constructed over the site of an earlier structure. Archeological work during the rebuilding of the frame portion revealed the remains of a stone chimney, fragments of Canton ware, and an 1831 penny. Deed research by PHW supports these archeological findings. The lot was purchased by John Lauck in 1821. Some sort of dwelling was likely in place by 1828 when it was purchased by William Blanchard. Language of the deed in 1852 when the property was sold to Edward Hoffman seem to indicate the brick house was not yet constructed. Tax records for 1881 indicate a jump in assessments, leading to speculation the Italianate improvements may have taken place that year. Work on 215 South Loudoun included repairing the existing porch and shutters, rebuilding and repointing the walls, jacking and leveling the frame extension and replacing the siding, and repairing and reglazing the existing windows. 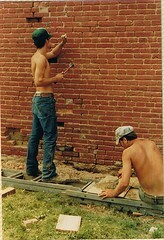 PHW placed special protective covenants on this property to specify all work during the repointing was to be done with hand tools to not damage the brick. Interior upgrades included new electrical, HVAC, plumbing, insulation, bathroom and kitchen facilities, as well as modifications to the interior stairs. With so much work to be done, it will come as no surprise 215 South Loudoun was a tax credit project. 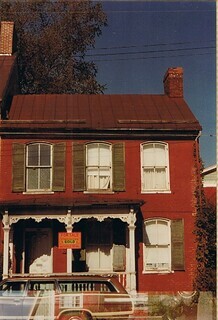 It was granted a Winchester Historic Building plaque in 1982. Much like the Huntsberry Building, this property displayed a dramatic upswing in value post-rehabilitation. PHW sold the property for a little less than $23,000. In 1985, the Smiths’ asking price was $125,000. The building, just off the walking mall, was used by the Smiths for their business, but was returned to residential use by its current owners. Be sure to visit the Flickr album to see many more images of 215 South Loudoun during its rehabilitation.